• Film: What’s Eating Gilbert Grape? Before the heights (or depths, depending on your opinion) of Titanic and the stardom that awaited him, DiCaprio done some low-key independent dramas and delivered some fantastic performances. In director Lasse Hallström’s What’s Eating Gilbert Grape? in 1993, DiCaprio (at just 19 years old) found his breakout role. He played Arnie Grape, a young teenager from a large, working class, dysfunctional family who happened to have learning disabilities. After many years and many films where he has delivered intense performances, when you look back at his work here, this still shines as a miraculous transformation and arguably his finest performance to date. As mentioned this was pre-stardom for DiCaprio and, personally, knowing nothing about this newcomer at this time, I remember wondering whether this young actor may have actually had some form of mild disabilities such is his understanding of the character and his limited comprehension. DiCaprio’s research for the role consisted of spending time with disabled children in order for him to fully embrace the role. It’s research that pays off in a beautifully nuanced piece of work where DiCaprio captures the ticks and mannerisms of his afflicted character and outshines a quality supporting cast. In fact, he wasn’t even supposed to be such a prominent character in the film but he gained much more focus due to his commitment and co-star Mary Steenburgen was so confident in this unknown actor (and his performance) that she was willing to pay him from her own salary. Oscars? – He received his first Oscar nomination for Best Supporting Actor but lost the award to Tommy Lee Jones in The Fugitive. This entry was posted on March 3, 2016 at 10:31 am and is filed under Uncategorized. You can follow any responses to this entry through the RSS 2.0 feed. You can leave a response, or trackback from your own site. I like the idea of this feature Mark, keep up the great work man. It’s fun to shake things up Mark. I always do it on my blog, it’s gotten a bit more raunchy. Nice write-up Mark. 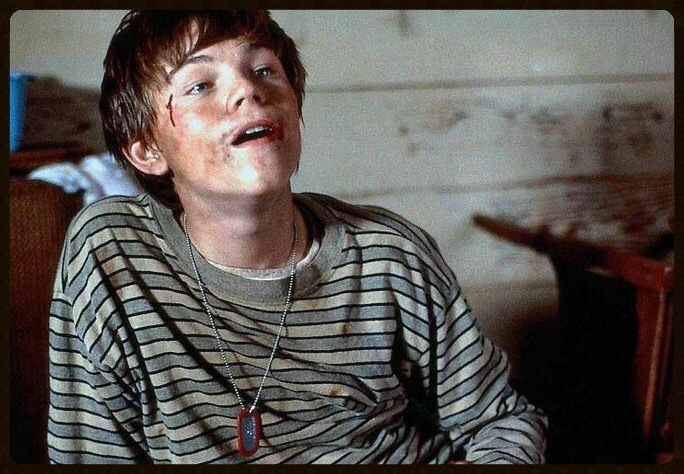 DiCaprio is in fine form in Gilbert Grape and I’d argue it’s still one of his best performances to date. By the way, while I did loathe Titanic, I thought DiCaprio was good in that, though he couldn’t save an awful script. Thanks Charles. I totally agree, man. I actually think it is still his best work. There’s plenty to choose from but I’ve never been more convinced by DiCaprio in a role than I was here. It’s an astounding performance. I wasn’t a fan of Titanic either. I hate it with a passion but you’re right! DiCaprio (and Winslet) can’t be blamed for a woeful script but there was even occasion when the dialogue was that bad that it made their performances look strained. I think I probably would say DiCaprio’s performance as Jordan Belfort in The Wolf of Wall Street would be my favorite, but Artie is still one of his best characters. Yeah, I can’t blame DiCaprio and Winslet for Titanic’s awfulness since they put a lot of effort in their roles, but Cameron’s script is just so terrible that it hurts their performance. Jordan Belfort was a great character (and performance). Definitely up there with his best work. I’m actually more drawn to his early stuff, though. This Boy’s Life was special too. He went toe-to-toe with DeNiro and managed to steal the film. Haha! “Jack”, “Rose”. That’s all you hear. Pretty poor, man. Gilbert Grape was pretty phenomenal. Pretty phenomenal indeed! I think it’s a great film and as good as everyone is in it, it’s still DiCaprio who takes centre stage. This performance, without a doubt, deserved an Oscar. He was spectacular! Couldn’t agree more Courtney. As much as I enjoy Tommy Lee Jones in The Fugitive, there’s no way he way he should have taken the Oscar that year. It was DiCaprio’s all the way. I like it man, and your reason for starting up this feature is basically the same as mine. It’s nice to write something that’s just about what an actor/character does and it’s not as much to do as a full-on review haha! This is a great choice. I too think this is his best performance. And he’s not even 20 f**king years old. Totally man! Sometimes it’s good to take a break from reviews and keep things a little fresh (and easier). I actually compiled a list like this years ago but it was done as a page which meant that it wasn’t a new post every now again. I kinda need this at the moment as I’m starting to become bit burnt out again. Yeah I am too bro. Have seriously considered dropping it for a bit. But I don’t know what else to do with myself haha. I hear you, man! I flick through Facebook sometimes and wonder why I waste my time…. I could be writing something or discussing something that really peaks my interest. I think it’s hard to stop blogging once you’ve started but it’s equally as hard to keep up. We are until we decide there’s something better or different. Hahah. So for me, a job would be nice doing this kind of stuff. I hear you, man! If I were getting paid, blogging would be a dream. As it stands, it’s just me spouting my opinion – for everyone to be subjected to. I certainly always enjoy reading what you and other bloggers who are, in the bigger scheme of things, tremendously undervalued. Writing anything takes skill and effort and creativity. Signing up for WordPress should qualify as a part-time job haha! WP should pay us!! Great feature to run, so looking forward to seeing the roles you post here! Ah, DiCaprio in anything is amazing, but his turn as Arnie Grape was fantastic, hands down. He never looked like he was acting, and he embodied the role perfectly. Not just saying this as a huge DiCaprio fan (of course), but because the man has buckets of talent and always delivers the goods. I actually watched this a few months ago and was amazed, again, by DiCaprio’s performance and also bitterly missed when Johnny Depp did real movies. He’s a fine actor for sure and buckets of talent for sure. I, however, still feel that this is his best performance. I reckon he’s got much, much more to offer but I hope he keeps pursuing roles that challenge him. He always delivers solid work but now that his Oscar for The Revenant is in the bag, I want to see Leo cleanse himself of this overhanging snub and go onto delve into further interesting roles. I thought he was great in The Revenant but it felt like an Oscar bait performance if you know what I mean? I want to see him relax a bit more… Be natural… And get back to performances of Arnie Grape. He seems too intense and determined just now. He needs to let his guard down and be more vulnerable again – like he was here. I totally get what you are saying and I absolutely agree with you on that front, so interested to see what he does next. Now that the Oscar thing is out of the way, he can go on to do so much more again, be more varied. The man is too amazing. I’d love something like Catch Me If You Can again as well. And The Wolf of Wall Street – for all sorts of outrageous reasons. Plus he and Scorsese work together so well, we just need another collaboration from them (and I am sure you will agree on that front). Well, there is definitely another Leo/Scorsese film in the works – The Devil in the White City. No word yet on a release date, though. I’m onboard with that when it arrives. It truly is a great performance and a very strong movie. There are so many scenes from that film that stand out to me. And you’re right, young Leo could easily be mistaken for an actor with a disability. Nice new feature, by the way. I loved the movie, Keith. Loved it. And DiCaprio really stood out, overall. I think his performance is a beautifully nuanced one. I personally work with people with such afflictions and disabilities and I can honestly say… He nails it. It’s an outstanding piece of work. I absolutely love DiCaprio’s pre-Titanic performances. I also like his performance in the Basketball Diaries. There is a distressing scene there where, I think, his mother shuts him out of the house. I thought it was very realistic. I here you!! Leo in his early days was something special. He’s lately fell into the angst ridden adult but when he was younger, his angst ridden roles really stood out. I thought he was marvellous in This Boy’s Life, Gilbert Grape and, as you mention, The Basketball Diaries. Let’s not forget that these are the films where he made his name. Personally speaking, I still think he’s never been better than he has in these three early films. A true indication of even more remarkable performances to follow. Absolutely, Abbi! It’s become too convenient for people, without question, to just know and love DiCaprio these days but many filmgoers sometimes fail to look back a little. Sure, he’s become a bonafide star but it’s often too easy to overlook that he’s also a quality actor. Grape says it all, really. Looking forward to more from this strand mate after this fine, info tastic entry.